BUT the observed sea level rise since 1969 was just 82.8mm (1.8mm/year), ~ 2% of his prediction. Sea level has risen at a rate of 1.8 ± 0.1 mm/yr (or 0.6 feet per century) for the last 94 years. 1977 was higher than 1988. Sea-Level in the Gulf of Maine in 2005 was 3mm higher than today. Going back to 1947, Sea-Level in the Gulf of Maine was identical to 2002. But when you look into it, surprisingly, Bangladesh is actually gaining more land area than its losing. Bangladesh’s main problems are not climate, they starts with the lasting legacy of the British Partition of India in 1947 (look to your history books), it’s population is growing faster than the land is accruing & forests are being cut in the foothills, increasing flooding from the monsoons. …try NOAA (National Oceanic and Atmospheric Administration). 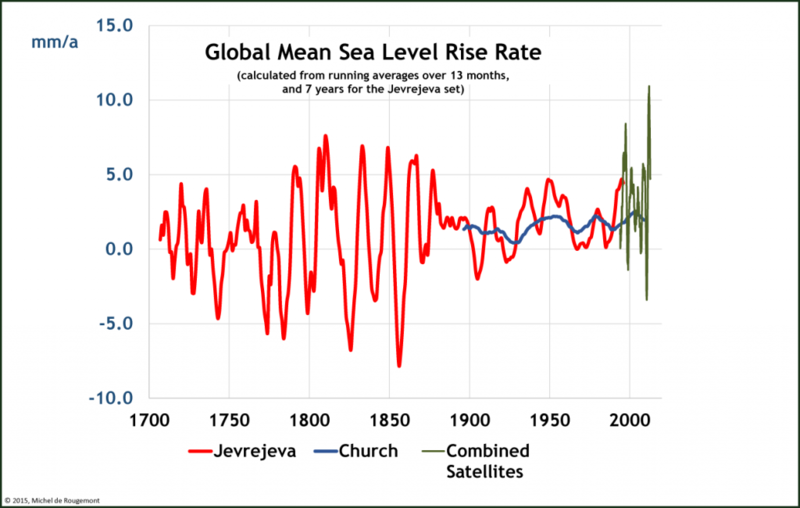 Absolute measured global sea level rise is just 1.7-1.8 **millimeters/year. ~ 180mm (7inch)/ century. Table 10.7 from the IPCC’s AR4 report – https://www.ipcc.ch/publications_and_data/ar4/wg1/en/ch10s10-6-5.html – tells us that in ALL scenarios Antarctica contributes negatively to sea level rise, because of increased snow & ice formation. The coefficient of correlation R2 for the Jevrejeva series is 0.0555, which indicates that nothing is statistically significant to determine an acceleration of the rate of rise over a long period of time.